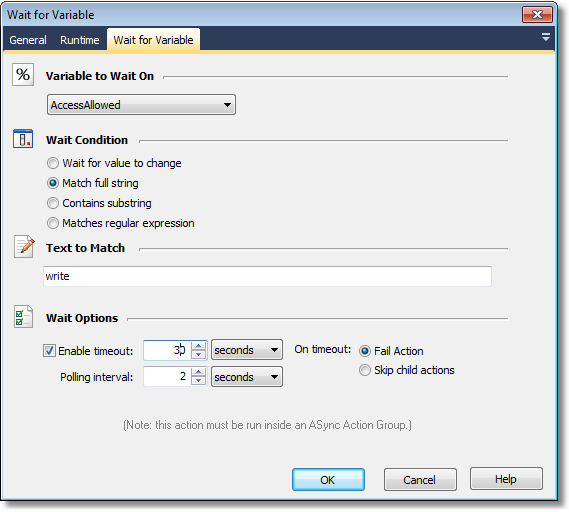 Wait for Variable pauses the project run until a given FinalBuilder variable has changed. The action will unblock as soon as the value of the variable changes, relative to its value when the action first runs. The action will unblock as soon as the variable's value matches exactly the text in the "Text to Match" edit field. The action will unblock as soon as the variable's value contains the text in the "Text to Match" edit field. The action will unblock as soon as the variable's value matches the regular expression specified in the "Text to Match" edit field. Enter the text to match against the condition. If the variable is a number, it is safe to enter numeric digits here. If the variable is boolean, use "True" and "False."